Ford’s tiny 1.0 liter EcoBoost engine has scored one of the fastest lap times ever at Germany’s Nurburgring Nordschleife circuit. 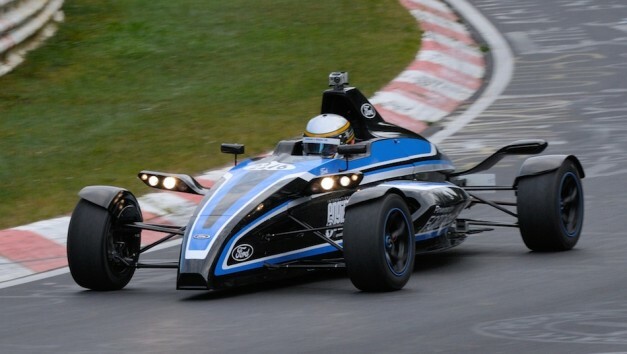 Going around the track in the form of a small Formula Ford race car, the racer completed the lap in just 7 minutes and 22 seconds, coming in higher on the list than such 600+ horsepower supercars as the Lamborghini Aventador, Ferrari Enzo and the Pagani Zonda. The 1.0 liter EcoBoost used in the Formula Ford was a modified version of the 177-hp to produce 202-hp. The engine allows the tiny race car to go from 0 to 62 mph in less than 4 seconds with a top speed of 158 mph. Unofficially, fuel-economy comes in at 118 mpg at 35 mph and 57 mpg at 75 mph. The New Subaru BRZ 2.0 N/A Boxer is taking 20psi + E85 on a totally unopened engine to give 11.2@127mph, real performance and it should be in the 10s next week - engine still stock but with a decent Garret shoving the CFM's down its throat. Only one member of the general public looking like an idiot in this thread . Like the 1.7 liter 600 + BHP BDA , the Pinto based Sierra Cosworth RS 500 engine or the BMW 1.5 litre Formula One engine that produced 1800 BHP in qualifying trim ( the Only car Nelson piquet said ever scared him , oh wait they did decimate and humiliate 6 cylinders and V8's and the odd V 12 too . Why cant some people just be happy Ford have made a groundbreaking engine with unheard of specific output and proved its metal on a racetrack . A truly remarkable achievment by Ford. Funnilly enough despite the baseless critism on here the world voted this International engine of the year . hmm lets see, a 1800bhp engine that was only capable of 1 lap even though the engine was only 1500 bhp. get your facts correct before critising someone comments. it may be engine of the year but it doesnt have any real world application.. a 1ltr 200bhp engine in even a focus would be useless. the engine may be awesome on a stand but chuck it in a body and it will be as slow and guzzling as a fat chick with a maccas coke!! remember the smart car with a hyabusa engine?
" hmm lets see, a 1800bhp engine that was only capable of 1 lap even though the engine was only 1500 bhp. get your facts correct before critising someone comments. it may be engine of the year but it doesnt have any real world application.. a 1ltr 200bhp engine in even a focus would be useless. the engine may be awesome on a stand but chuck it in a body and it will be as slow and guzzling as a fat chick with a maccas coke!!" Hmm lets see , if you read Nelson Piquets book they fessed up to 1500 BHP ( although it was actually making a lot more power ) for fear of FISA clamping down on qualifying engines . Get your facts straight ! No real world application you say , so the millions of cars that will hit our streets over the next decade or so powered by this engine will be figments of our imagination will they ? And I am absolutely certain Ford have spent the millions of dollars they would have to develop and engine just so Allan Mullaly can kiss it on a stand . But it will still be faster than a normally aspirated EF .